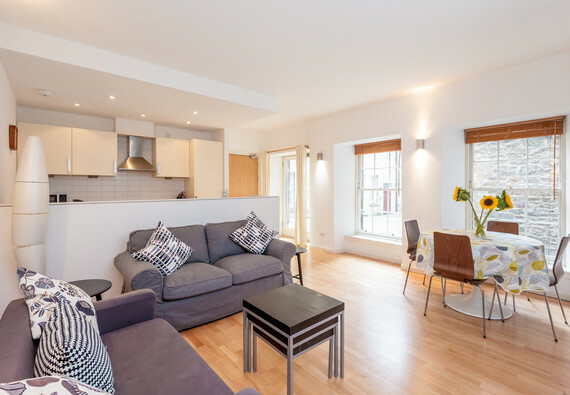 Located in a cozy Close just off the The Grassmarket is this gorgeous studio apartment, ready and waiting to show you Edinburgh. With all of the main attractions right on your doorstep, you’re perfectly placed for a whistle-stop weekend or fun-packed fortnight in Scotland’s capital. Guests are treated to the best of both worlds, as the apartment is housed in a 200 year old building, formally the Traverse theatre, yet is fully modernised. The Edmonstone’s Close Residence sleeps up to four guests, and is fully equipped with everything you need for your home away from home. The living space has a spacious and airy feel, and features modern furnishing including comfy sofas, dining table, and contemporary art. If you can tear yourself away from the local eateries, the fully fitted kitchenette is on hand to help you rustle up your own culinary delights, and has all mod cons and appliances. A TV, DVD player and WiFi are all available for guests’ use. The shared courtyard can be accessed from French doors in the living area. A kingsize bed and plentiful guest storage hide behind a clever partition, providing space and privacy from the living area. A further two guests can be accommodated on the sofa bed in the living area, however guests should note that this is a studio apartment, and so the two areas are not completely separated. A contemporary bathroom with shower over bath completes this truly delightful holiday apartment. Immediately outside of the Close is The Grassmarket, a historic marketplace that has maintained its shape and a number of its historic buildings, hosting traditional pubs and restaurants. Adjoining it is the colourful West Bow/Victoria Street containing independent shops, further restaurants and pubs. Just round the corner is The Royal Mile and Edinburgh Castle. A short walk away is George IV Bridge, where you can catch buses to other areas of the city. Waverley train station is less than one mile away. Sleeping arrangements 1 kingsize bed and one double sofa bed - please note that this is a studio apartment, please see floor plan for further clarification. Exterior This apartment forms part of a tradition tenement within a private close. French doors lead out into a private courtyard. Interior layout A hallway leads to separate bathroom, and open plan living/kitchen area with partition to bedroom. Perfect location. Perfect apartment. The apartment is Spacious, well laid out, everything you need for a day or a month. The location couldn't be better. Easy to find the apartment we wanted and the location. The apartment manager was on time and very nice.